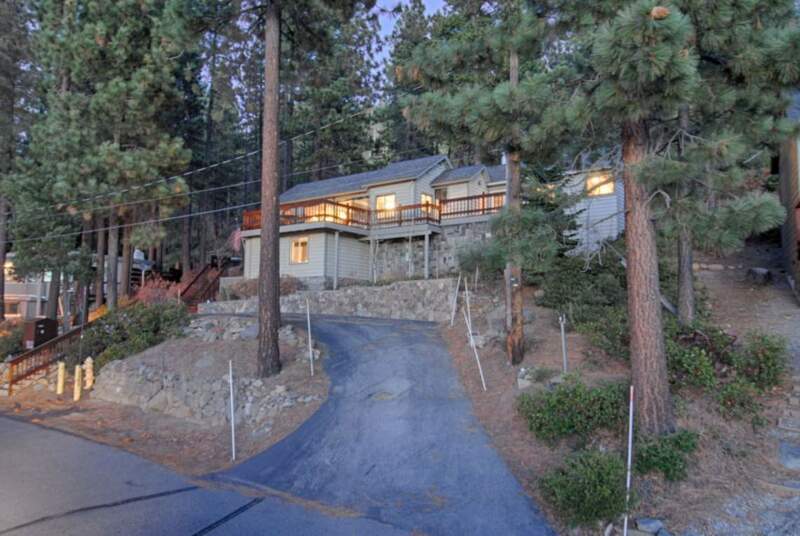 Looking for a nice home in a beautiful setting? 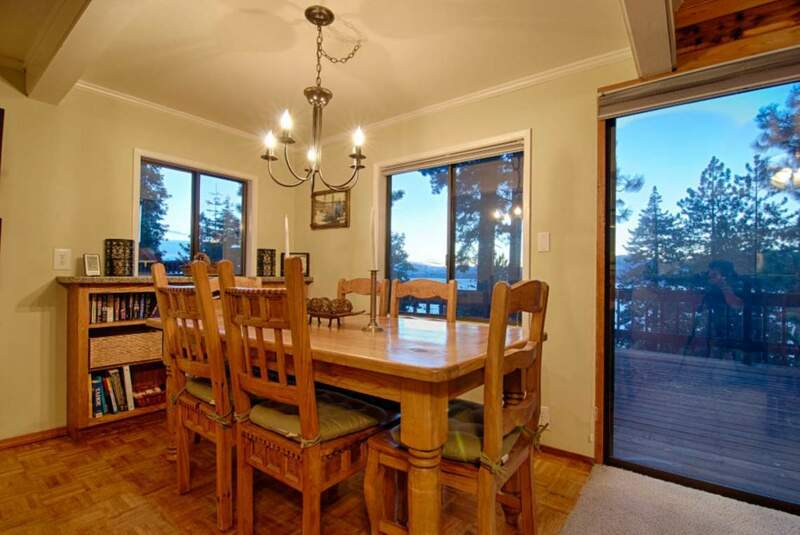 This traditional, updated Tahoe cabin boasts fabulous lake views with all the amenities and comforts of home. 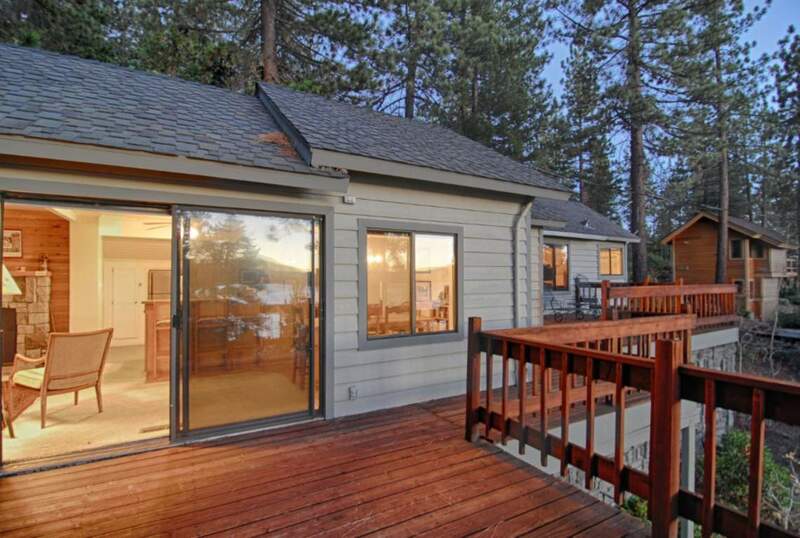 The 3 bedroom, 2.5 bath home offers stunning Lake Tahoe views from almost every room and is in a great neighborhood between Kings Beach and Crystal Bay. 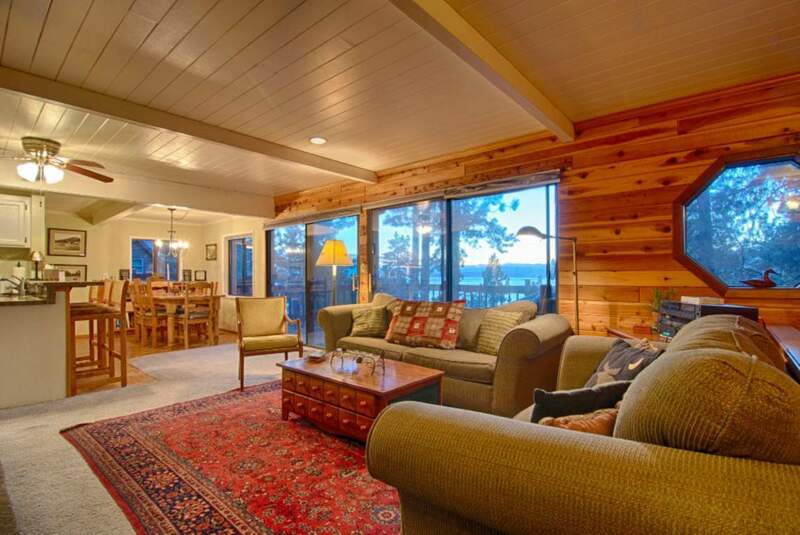 This sunny home has updated furnishings and antiques throughout, with WIFI, two gas fireplaces, two flat screen TVs and a large deck with views of Lake Tahoe. 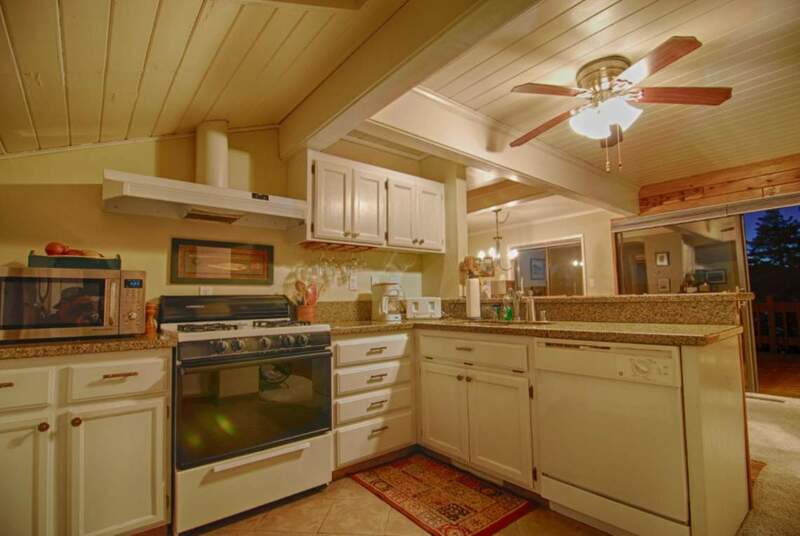 The kitchen has new granite counters, gas range, refrigerator, dishwasher, microwave, toaster oven and a breakfast bar. The dining room seats 6 at a rustic pine table; the living room features two couches, a gas fireplace, flat screen TV with expanded cable, DVD and stereo. 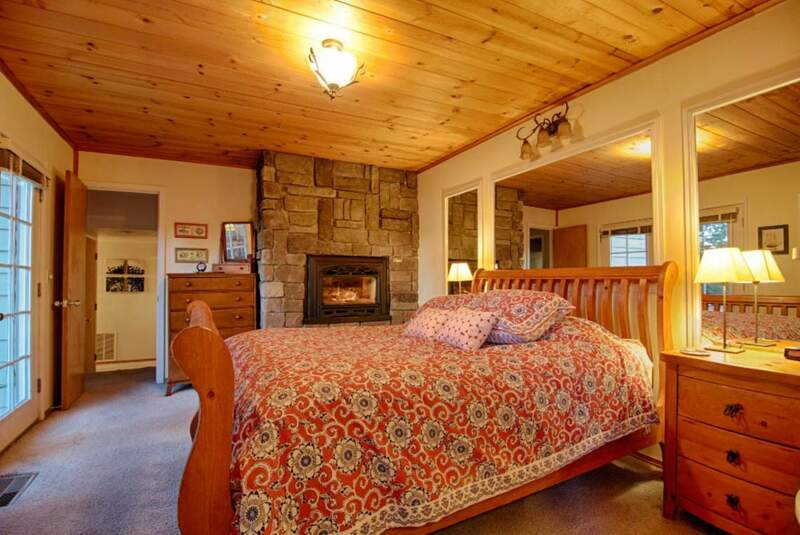 – Master bedroom has a Queen bed with a new foam Sealy mattress, gas fireplace, flat screen TV with expanded cable, iPod speaker, and an en-suite bath with jetted tub and shower combination. There is a walk-in closet for luggage storage. French doors from the bedroom open to the deck with two chaise lounges and a patio table with umbrella – all with lake views. 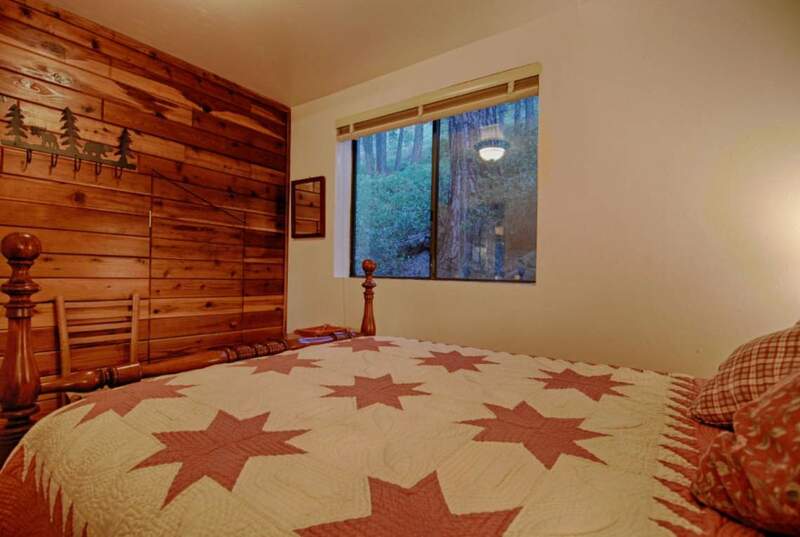 -The second bedroom has a Full bed with antique bed-frame and bedside tables. 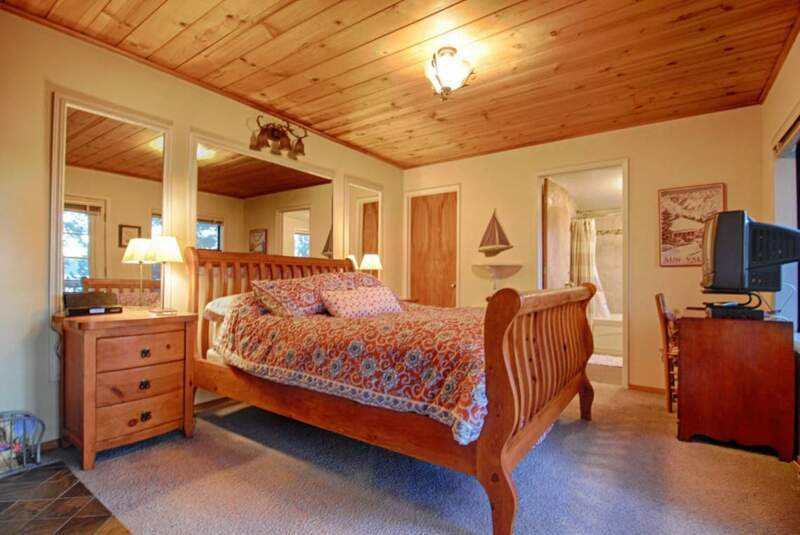 This room has an expansive view of US forest preserve land. 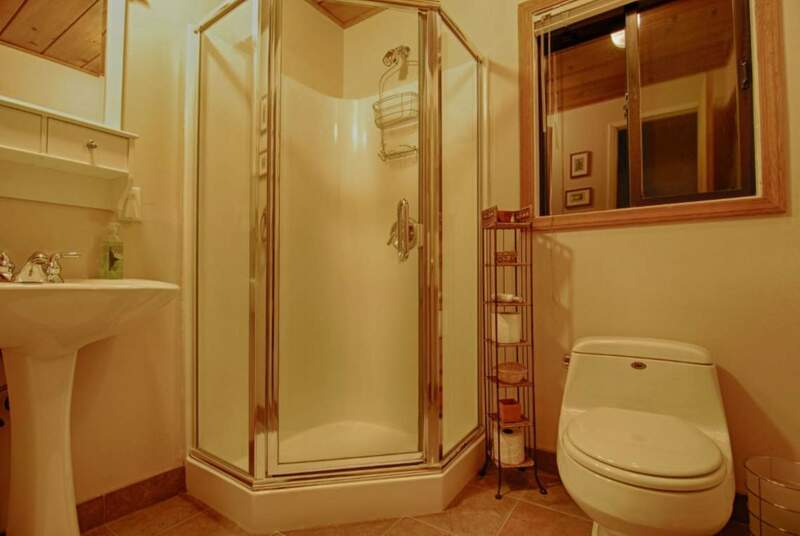 There is a bathroom with updated vanity, shower and toilet across the hall. 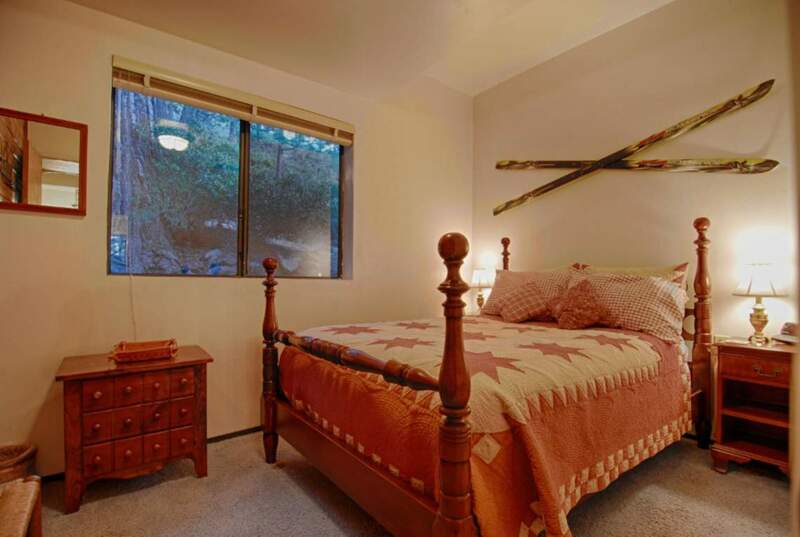 -The third bedroom has 2 Twin beds with a view of the lake and an updated half bathroom with sink & toilet ensuite. 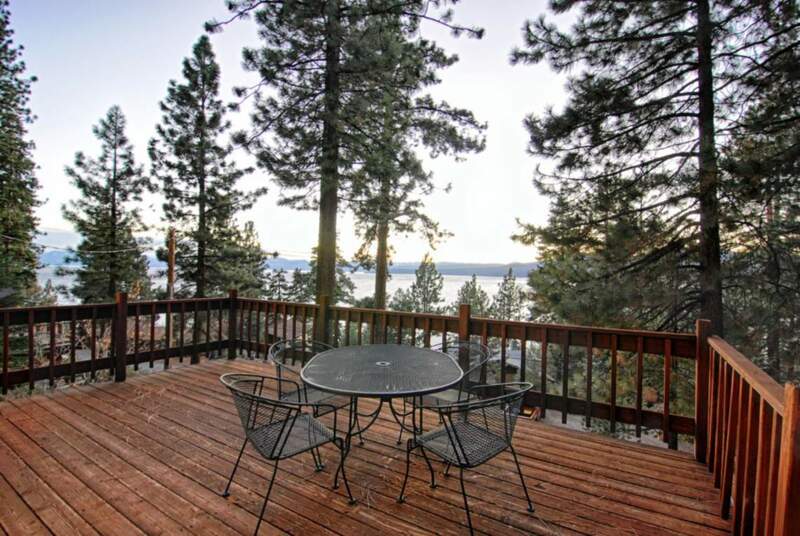 One of the best features of this home is the large, recently stained deck that faces Lake Tahoe. 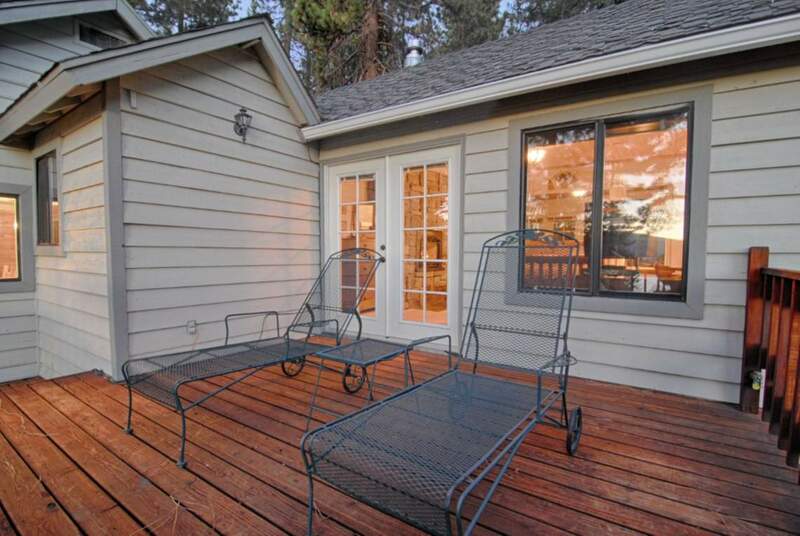 It has comfy chaise lounge chairs and an outdoor dining table with umbrella that seats 6. The stone-lined back patio has a charcoal Weber BBQ and outdoor seating that gets morning sun. 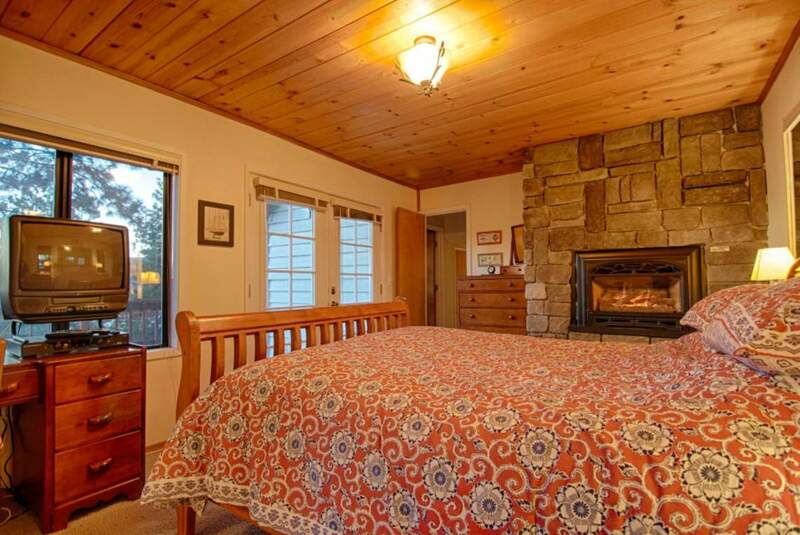 This updated home sleeps 6 people and is best suited for couples or a family with children. Pets negotiable ~ See agent for breed, weight and other restrictions. Pet fee required. PARKING: 4WD or chains may be needed to access this property in the winter months. The driveway is a U-Shaped one that is uphill on the entry and downhill on the exit. Pretty steep! Parking for about 3 cars there. There is one additional space along the retaining wall and road below the driveway. We had a really great stay here. We went with five people and had plenty of room. Really liked everything. Super convenient. Nice home with gorgeous view of the lake. Highly recommend! Good location, nice home with 3 cozy and practical bedrooms, well equipped kitchen and nice jacuzzi tub in master. Very helpful and responsive property managers. 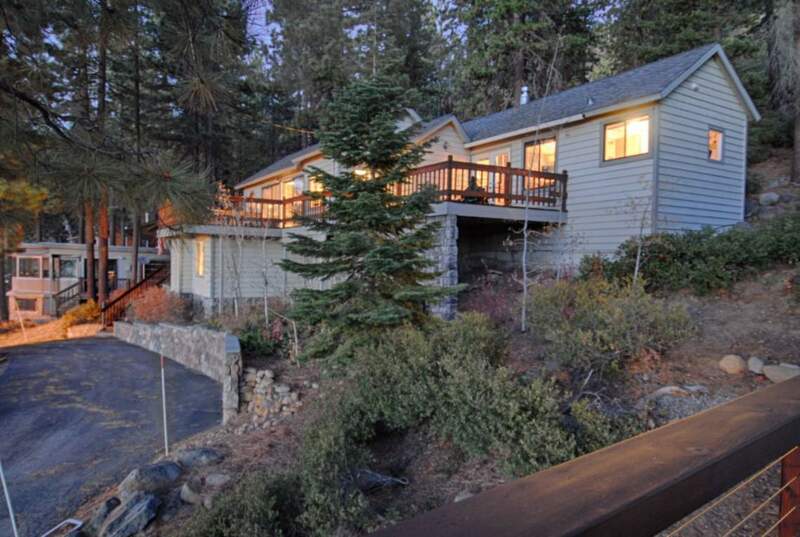 I’ll stay here again as it’s minutes from Diamond Peak and 15 minutes from Northstar. My family of four stayed at the lake view cottage over Christmas 2018. 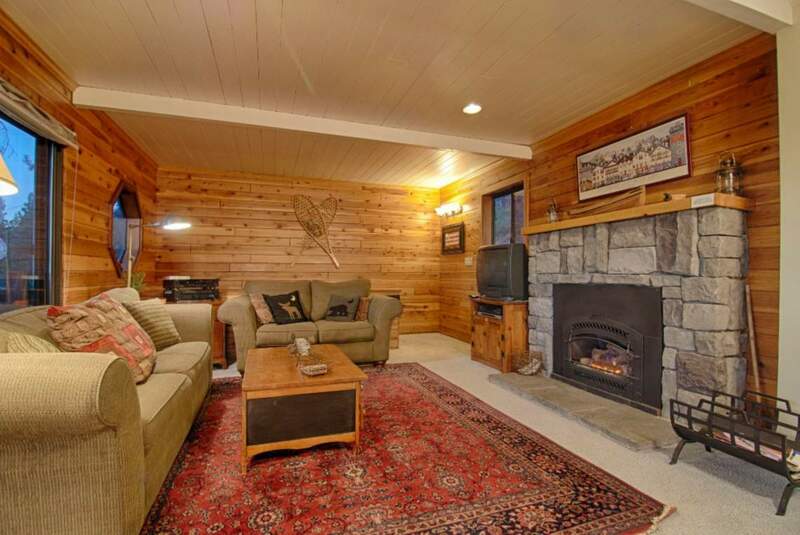 We found the cabin to be a warm and cozy place to enjoy the holiday. It is well stocked with everything you need for a comfortable stay, and is close to stores, shops and casinos.. We enjoyed our stay and would definitely go back in the future. 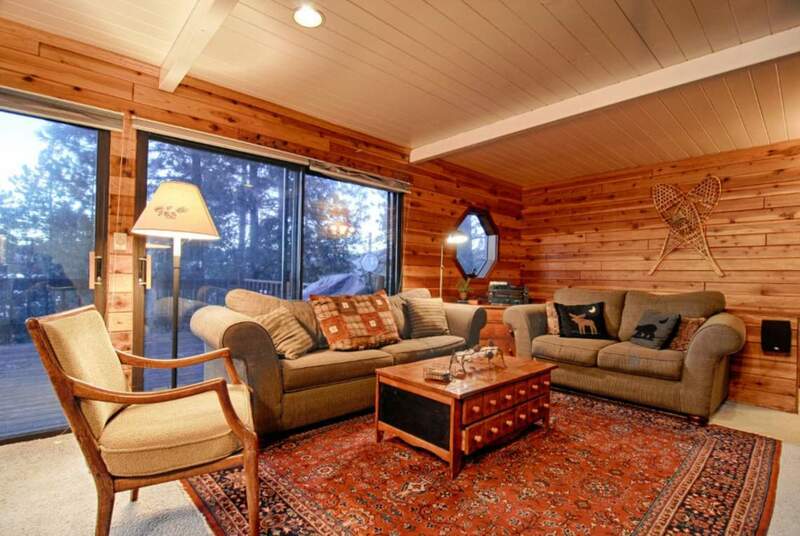 "Run by a corporate rental agency in North Lake Tahoe, it's a classic / standard Tahoe ski rental cabin, exactly as described. 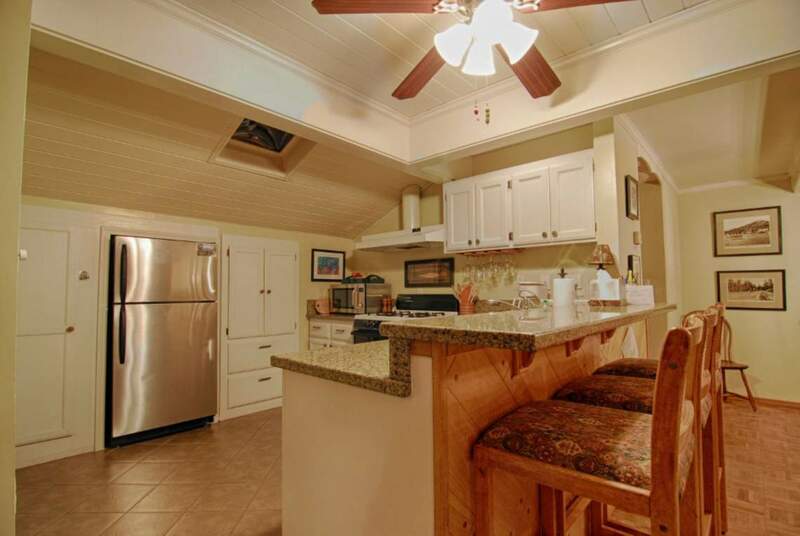 The kitchen is minimally but functionally outfitted, the beds are as-described, the shower water pressure is good. Note that there's a flight of stairs between the front door and the main living room area. There's 2.5 baths -- one full bath in the main living area, a full bath in the master, and a small awkward toilet in the downstairs bedroom space. The pull out sofa is extremely uncomfortable, but the listing clearly states as much, so that was not an issue for us, but it's something to be aware of. I'd stay here again." STUNNING LAKE VIEW COTTAGE IN KINGS BEACH! 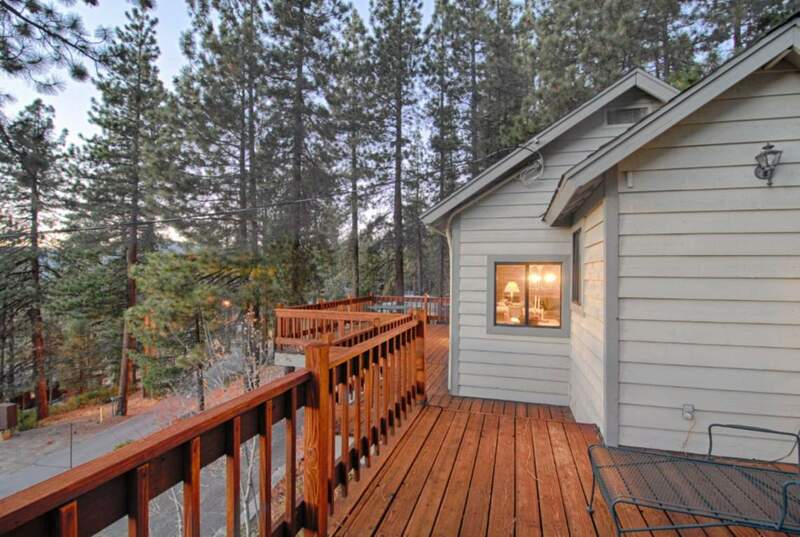 An excellent Lake View Cottage that fit our needs. Probably all around better than any VRBO I've ever used. 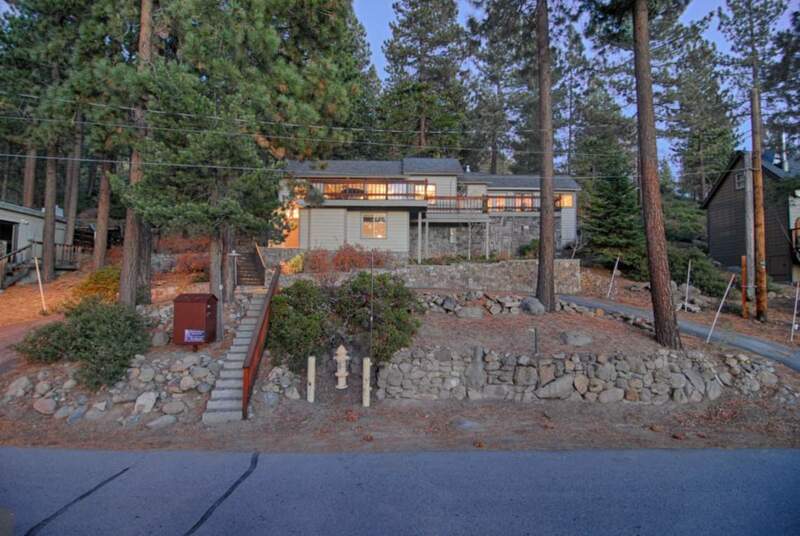 On a hillside at the eastern edge of Kings Beach with a great Lake Tahoe view, sits this little gem of a house. It’s worn enough so you don’t worry about cuddling up on the couch with your dog. Well stocked and well located. 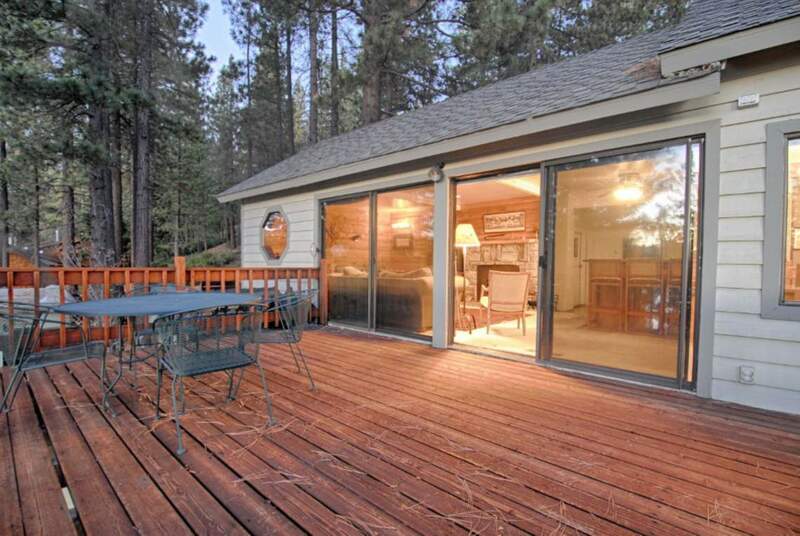 The deck is amazing—great for eating meals under the umbrella, or relaxing in a lounge chair reading a beautiful ok. It is not airconditioned but once we got the hang of using the blinds and the fan, we found it comfortable all the time. Off street parking and a reserved in street space. All-in-all, a great getaway. Nice place and good view really enjoyed our stay!! Perfect place and location for me and my two teenagers. We love the Kings beach area and this is close enough to access without being in the middle of the hub bub. The cabin is small but very cozy. And the views are fabulous. Loved sitting on the deck in the evening watching the sun set. Will definitely consider staying here again. Great view location and everything we needed. View was amazing and very clean!! Had an amazing Mother’s Day weekend in this beautiful home. The view is breathtaking. House was very clean and beds were comfortable. Even the dog had a great time. I definitely recommend staying here! !